What shaped up as another bruising ballot battle between union and business coalitions over worker pay, benefits and obligations has fizzled with Proposition 11. The measure was funded by the companies which provide the private ambulance services which provide the majority of such services in the state. These companies, led by American Medical Response, were responding to the fallout from a 2016 California Supreme Court ruling which held that private security guards couldn’t be compelled to remain on call during their breaks. This led some paramedics and emergency medical technicians (EMTs) to sue in state court, arguing that they were also covered by this ruling and shouldn’t be compelled to remain on call during their breaks. Private ambulance firms noted that traditionally in California, all first responders – public or private – have been on call during breaks. These firms warned state lawmakers that having to add ambulances and paramedics and EMTs so they can provide minimum service during break times could cost up to $100 million a year – costs that would be passed on to taxpayers by local governments which rely on private ambulances and on to residents via increases in their health insurance rates. But after the Legislature decided not to step in, private ambulance firms paid millions of dollars to signature gatherers to gain a spot on the ballot for what became Proposition 11. 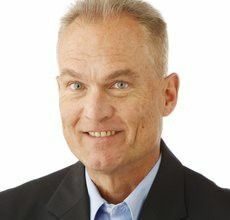 It would write into state law the obligation that private first responders must be on call during breaks and limit the liabilities faced by ambulance companies for lawsuits filed before the ballot initiative was launched late last year. The response from the California labor establishment has been surprisingly passive. While some have written opinion pieces with sharp criticism of Proposition 11 – calling it bad for public safety, an abuse of the initiative process and a corporate power play – none of these arguments were put directly before the large number of state voters who for generations have relied on the official state voters guide in making up their minds on ballot propositions. 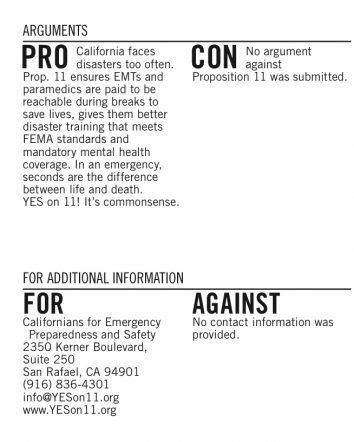 Prepared by the Secretary of State’s Office, the guide for Nov. 6 elections notes that no one – not a labor group or a paramedic or someone with an ax to grind about private ambulance firms – submitted an argument opposing Proposition 11 or provided a website or additional information on why it should be opposed (pictured). This is unusual in California direct democracy. But when it comes to a seemingly high-stakes battle involving union members and big business, it appears to have no modern precedent. Proponents of the measure say Proposition 11 might not be popular with union rank-and-file members because it includes concessions that haven’t gotten much attention from the media. It would require ambulance providers to provide ambulance staffers with a range of mental-health services, including up to 10 paid visits a year to clinics or hospitals. But the main theory in political circles is that in a year in which the U.S. Supreme Court has said public employees can decline to pay dues to their unions, a fight against a well-funded, widely endorsed ballot measure that preserves the status quo for the union members if affects isn’t a high priority.